The Tribe played, baked, or otherwise kept themselves busy. Layla was plopped in the way only a teenager can, in front of the tv. Her eyes were blank and it was obvious that she was seeing nothing on the screen in front of her. I tried to sit on the front stoop and read but, my mind refused to focus on the words in front of me. I wandered back in and whispered to Layla, "go get in granma's truck". She looked at me as if she couldn't quite grasp what I was telling her. Then, she nodded, slipped on her tennis shoes and ambeled out the door in her slow, I am a totally bored teenager, way. I told granma that I wanted to visit the river with Layla. "Will you watch the rest of the Tribe?" She smiled and nodded. It amazes me the way close families can communicate with few words. "Where we goin'?" Laya asked as the old truck rattled to life. "I thought the river might be pretty just now and I'm bored" I told her. "Cool, me too". As we turned off the main road an onto the path to the water Layla spotted bunnies. I grabbed for my camara and told her to take the wheel. We moved forward slowly with me hanging out the window and trying to find the bunnies throught the view finder, Layla trying to keep us from driving into a ditch. Once at the waters edge she looked for pretty stones and I tried to find cool things to take pictures of. We were together but focused on different things. It allowed for comfortable conversation without strain or pressure. We watched fish jump, dragonflies race and threw stones. We chatted and were just together. We were both quiet on the walk back to the truck. The ground was rocky and barren but as we rounded a corner I saw a tiny mustard plant that had not only pushed it's way up throught the rocks but had bloomed. A tiny plant with a tenatious hold on life not only surved but prospered. It reminded me of my Layla. We drove home chattering and in good spirits. It was a short but refreshing visit. We were almost to the main road and Layla pointed out the window, "look, deer". There at the edge of the clearing was a doe and fawn. Both stoped and watched us with liquid brown eyes. Their ears and tails flicked but they stood frozen watching us watch them. I tried for a picture but it blured as they moved into the cover of the forest. Another great symbol, I don't question it's source. A mother and child finding strength and facing the fear of the unknown together. No need to panic or run away, just head for the shelter where weary find peace. "Mommy, time for dinner. Pancakes!" I could tell just by the way the storm looked at a distance that it was to be a bad one. There was none of the radiant light or cool winds of the leading edge that signal a powerful but much needed summer storm. This one loomed black and ominous, a solid wall of darkness that I somehow knew would break bad. All afternoon it sat at a distance and continued to build. By early evening it had grown to massive proportions and I could feel it's dark presents without even looking to see it was there. Eventually it began to move forward, slowly at first then building speed and momentum. When it broke it was with the furry and rage of a wounded beast, mauling and maiming everything in it's path. Seeking to inflict as much damage and cause as much pain as possible before it's life drained away. It was an evil thing with a dark heart and seeking naught but to destroy. I can't say for sure how long it lasted it, a few hours maybe, but it felt like days. There was no chance of sleep, no way to find comfort. It drained the hope and wearied the hearts of all it came upon. When it did eventually move off it left a wake of devastation and pain. What had taken years to build up was laid to waste in mere minutes, all that was left lay desolate and empty. Shattered remnants of what had been before could be found scattered about, bits and pieces of what bad once been lives. What happens next is yet to be seen. Sunday at the cabin with Granma and PaPaw, kitties, doggies, lots of outside space to play and just being away from the routine of home. The Tribe is in heaven! The best thing about the cabin is cooking over the open fire. No bbq here, this is an open pit with real wood and a grate that swings over the coals to grill on. Eveything tastes better over the open fire. The Tribe follows Papaw to the pile of dead and down wood. Wagons and wheelbarows are loaded and off to the pit they go. After a scrumptous dinner of grilled burgers and squash from the garden it's time to break out the 'smarsh mallows'. The fire has burned low and the coals are nice and hot. The rocks around the edge of the fire pit are the perfect resting spot a roasting stick. The heat is on! Who can have the best toasted mallow without having to put out flame? They did well, no burns, only a few mallow sacrefices to the pit fire goddess, lots of sticky faces and fingers! Score one for The Tribe, the Staypuff man has been defeated... and he was DEWISHOUS! Okay, it wasn't my first choice but I can't argue, he likes to fight and the whiskers are cute! He was racing his bike up and down the driveway as fast as he could possibly go. He's only had the training wheels off for a few weeks but he has no fear of falling, no idea that anything bad could happen to him. I refuse to watch! With every wiggle of the front tire, every near miss I can see him sailing through the air and I know there is no way to catch him, no way to stop the pain of the impact or the terror he'll feel in the milliseconds preceding it. I pull weeds, with my back to the driveway, refusing to look up. My mind wanders to some of the nasty crashes on my bike when I was a kid. It's part of life, part of growing up and into who we will one day be. My thoughts are jolted my a scream, Maaaaammmmm!!!!!! MOMMY, MOMMY! I jump up and out or my thoughts. The inevitable has happened, he's wiped out. I run to the end of the driveway, I never realized how long it is. He is sitting up holding his knees. His helmet is still on straight so I know the critical part is okay. As I carry him into the house the crying stops, man that is a really looong driveway. He has ugly scrapes and some mild road rash but nothing a jumbo band-aid, a spoon of peanut butter and a movie won't fix. After lots of hugs and kisses I tell him it was a really cool crash and he was really brave. He grins, "thanks mom". As I'm popping popcorn for the movie and spooning the peanut butter I think back on the wipe outs I've had today. I realize then that my Father was watching me, seeing the front wheel wobble, watching me go faster and faster until the inevitable happened. "I'm here" He said, "let me carry you for a while, until you feel better". Unlike Farm Boy I didn't cry out, I should have but I didn't. He was there anyway. Always there ready to pick up the pieces when I have raced off on my own. Even when I fail to heed His warnings, when I go and do without consulting Him first, even when I break His heart He is there to shelter me in his love and mercy. I have to wonder though, since I'm sure there are no weeds in heaven what does He do while He waits for me to crash? Not sure what to do with the family on a sweltering summers afternoon? Tired of going to the pool, grilling in the back yard? Why not try having a spontaneous hay day (SHD)! For your very own SHD all you need is a friend with hay fields that have been cut and baled, a tractor, hay wagon, hay elevator and an empty hay loft. For extra excitement you can throw in an impending thunder storm. Our SHD started with a phone call from Gyps asking "how many kids do you have today". This is a difficult question because I never pay attention to how many kids are at my house on any given day at any given hour. There are always more than a few and less than you'd find at Kings Dominion. I had to think about this... okay two that are just on loan from the neighbor are leaving in about 30 minutes..."ummm, let me see, five kids and Todd so that's six"! Gyps explains the event for the afternoon, hay, heat, humidity and kids (that will be dead tired when we are done). "I'll be there in an hour" I told her. We pull up to the farm to see and empty hay wagon parked beside the road. "Oh darn" Todd said. "I guess they're done already". The Tribe make disappointed kid sounds in the back of the van. "Just keep going" I tell him. We crest the hill and round the corner to the horse barn and there is the OTHER hay wagon being unloaded and bales being run up the elevator, (a long, elevated belt that takes the bales from ground level up into the loft). The Tribe pile out and charge forward in mass towards the belts, chains and gears of the moving elevator. After introductions and a little organization we went to work. We had workers in the loft to catching bales and handing them to others that could throw the bale to the top of the pile and stack it. Another team worked out in the hot sun carrying bales to the elevator and the last team went out into the field to pick up bales and throw them in the hay wagon as it rolled past. It was an AWSOME day! Everyone worked at top speed due to the rumbling of thunder in the distance. All afternoon we stacked, carried and threw bales like people possessed. Lungs burning with hay dust, eyes stinging with sweat and arms aching, we shoved the last bale into the loft and scoope d the last of the loose fallen hay under cover just as the rain began to fall. As the rain pored down The Tribe loaded into the van. They were hot, smelly, dog tired, smelly, itchy and did I mention smelly, oh and they were beaming with pride. They made new friends and got to hang with the Gypsinator. We got to work together as a family. Even Todd had a good time and I was in heaven. Hay, horses, my favorite twin sister and my totally hot (literally and figuratively) farm boy / husband. Yes, life is good! Hay has been used for thousands of years as a binding agent for bricks. Mix hay or straw with some mud, bake it in the hot hot sun and it can last through the ages. I see now that hay and hot sun can bind families and friends as well. At my very first Karate shiai (test) I stood in front of the testing panel and announced, "Sensei, I will attempt to... !" Sensei Peeler, the head of our style who had flown in Detroit just for this test stopped me. "You will what" he asked? I realized my mistake as it came from my mouth and now, in front of a very large group of very high ranking Karate masters I knew that everyone had heard it. Shaking in my gee I announced again, "Sensei, I will break one board with otoshi tettsui (downward hammer fist)". My first thought was to throw up but that would show a lack of respect in the dojo. As I move towards the board and the cinder blocks holding it up my knees began to shake. Sensei was in front of me guiding my stance and wind-up. The Tribe was behind me cheering me on. I cleared my mind and moved into my stance. Breath, wind up, breath, punch, kiai (yell), BANG! The board was not in two pieces at my feet. I quickly forgot the tingling in my hand and soaked up the screams and cheers from The Tribe and the rest of the class behind me. This was just the first of many firsts in my journey through the world of martial arts (just wait 'till I tell you about my chi). But, it was a break through (no pun intended) for my mind. I was able to use my mind and body as a tool to do some serious damage to a 1 inch thick board. I was strong and powerful, I am strong and powerful, 1 inch thick boards everywhere fear me. Saturday my mind and body will again be tested. This time I decided to play Bruce Lee and break with an open knife hand. I poke at the soft flesh on the lower part of my hand that runs upwards towards my pinkie finger. Not very dangerous looking. I wonder, did I take on too much... can I really do this and not do serious damage to my hand? I can do this, I will do this and Saturday evening I will tie my yellow belt around my shattered board and my blue belt around my waist! I am strong, I am powerful! An idea comes into my head. A dream has been living in my heart for a long time now. The two begin to meld. But, there is so much fragmentation. Like a piece of shattered pottery that I have never seen complete and now I need to put it back together. The pieces drift thought my mind, tiny bits that look familiar and then spaces where just nothing seems to fit. I know the Lord is trying to speak to me and I am working so hard to figure out what he is saying. I'm blocking Him out. This has to be His plan, His dream and all I can contribute is my willingness and faith. Even in it's fragmented state the unfolding idea is an island and I am on the far shore looking through a misty shroud across the water. A bridge must be built... stone by stone, each carefully placed until a way is made to cross. Today was cool and wet. We had planned one last day at the beach but ended up at the outlet mall instead. After the wet start I had hoped to spend a few more hours exploring Brookgreen Gardens, but the glut of incoming vacationers on the highway prevented that from happening. Such is life while on vacation. It's all an adventure and more fun if each moment is lived rather than choreographed. So now what? We have to pack this evening so that we can load and roll first thing tomorrow. I guess the beach and gardens will have to wait until next year. The week has flown by and tons of fun was had by all. Some did well and others need some work on dealing with excitement and self control. Being this was our first real vacation with the entire tribe of nine I think we did okay. New movies have been purchased for the return trip and a new route has been plotted (some little bug in my ear said it's never any fun to back track). The girls will have to "wear" their boogie boards to get them home and I plan to make Todd stop frequently for photos. I guess that means the vacation isn't over until we are all snuggled at home in our beds. Oh, I can't wait! Get he escrima sticks ready Gyps!!! The Tribe is commin' home! I wandered along winding stone paths, marveling at the intricate sculptures, manicured gardens and unique flowers. I was in awe of the Spanish moss trailing from ancient live oak trees who's massive arms hugged the earth as though the years and sorrows of those who admired them sapped them of all strength. Over head thunder clouds billowed towards the heavens. The sky darkened and thunder pounded an ominous warning for all who would listen. Drum beats and cannon fire from days gone by. The Dogwood Garden and The Trail Beyond the Garden Wall beckoned but the impending storm kept me at bay. The pictures and memories call to me, pulling me back to see what beauty lies around the next bend in the path. Am I a curmudgeon or are the bonds that tie me to home stronger that I thought??? Before we left I was feeling trapped by the routine. 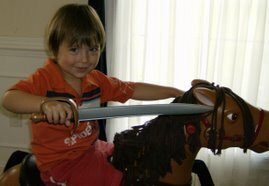 School, day to day chores, squeezing in a smidge of time for a riding / training lesson, trying to get dinner cooked and on the table before karate class. This morning I woke up with a twinge, an ache deep inside. Suddenly I was desperate to get to the PC so I could check on the Gypsinator's blog and see what is happening at home... maybe if I was lucky I'd get an email from Mom and in an hour I'd call Jen to see how things are with her kids, animals, and life. I had no idea how safe and secure my routine is. There is comfort in the little things that make life mundane, or at least seem mundane. The storms here don't build the same as at home, the people are friendly but they aren't the familiar faces that I know I've seen before, there are no little furry faces that follow me from room to room. I know that once we get moving I'll feel better but at this moment.... I just want to go home. We are all crispy kritters but what a day at the beach! We took lot's of sunscreen, water, snacks and an umbrella. Todd and the bigger kids spent most of the day in the surf. The littler ones and I stayed at the water line and played in the breakers. The water was cool but not cold, the sun warm but with the breeze the temp was perfect. After a few hours in the sun and sand the tribe decided a siesta was the next best course of action. Sparkling green eyes peer up at me through whisps of wind blown blond hair. "Tell me again what we're gonna' do for my birth-day, mom". Gee so many choices, there are fireworks tonight at the golf course so that's a given, and he said he wanted to go out for dinner. "Do you still want to eat out tonight" I ask. "Oh yea, steak remember". He is only turning 6... but he knows I love baked potato. I say only turning 6 but in so many countries he would be one of only a few that live past the age of 5. He is a charmer, smart and always ready with snappy come-back. Being five years younger than his sister JT was essentially an only child. He spent his first three years rarely seeing anthing lower than my hip... or his dad's arms. Then one day everything changed! A two month old baby came into his world. Followed shortly after by an 18 month old baby... For the first time JT had to share his toys, his sippy cups and OH MAN, his mommy. A year later an older brother and sister were added to the mix. Another year and he got yet another older sister. He took each is stride and now just assumes that all families are like his, The Tribe. So, here's to you JT! My little sunshine, full of kindness for all living things, a bubbeling cup joy and wonder. You make the world a better place for just being in it. I hope you have the happiest birth-day ever! 02:30 am - and the alarm is going off. Was I of sound mind when I agreeded to this? 04:30 am - Kitten is tucked in with Gran-ma (he tried to sneek into my luggage twice). Seven sleepy heads are now wide awake and buckled into car-seat, booster-seats and seat belts. The excitement is palpable as the van rolls out into the pre-dawn light. 06:30 am - After an hour three little ones have noded off again. The rest are glued to a DVD (I love technology). BJ wakes up and wants food. He is soon followed by the rest of the Tribe. A hungry tribe is a force to be reckoned with. 08:30 am - Shoney's buffett will never be the same again. 1:00 pm - Eight hours in the car and only a few stops for "tinlkle winkle" and petrol. We have to feed the Tribe again. The din is mind numbing and I'm getting really grumpy! Hurray for Burger King with a playground. 2:30 pm - We have found "home" for the next week. It's beautiful and really clean, with glass glasses, light colored carpet under the dinning table and it's on the third floor. (thank you Sensei for the strength training). 4:30 pm - The three youngest of the Tribe witness the beauty and magnifigance of the ocean for the first time. Todd and I stand in the breakers as seven beautiful little people search for shells in the sand and squeal with delight as the waves wash over their feet. The fussing and whining are forgotten. My heart soars and my eyes mist. "Thank you Lord for this day and this opportunity". A feeling of pure joy and satisfaction washes over me. "Mom, I gotta' go pee pee". Back to the real world. 7:00 pm - Note to self - avoid at all cost grocery stores on Saturday evening is a beach town. 9:00 pm - Seven little ones are asleep. My eyes feel like burnt holes in a blanket. We survived day one. Hopfully my beach updates will be more timley than the beach cam. Either it's hung up or.... could it be that it's always day time in Myrtle Beach? So, how many times will JT ask, how much longer? How many times will we leave a rest stop and M will say "I need to go potty"? The answers to these and more questions to follow! The plan is to depart at 04:00 Saturday morning... after copeus amounts of coffee that is. Arrive just after lunch, nap at the beach and go out to a nice casual dinner with the family. With 7 kids... yea right. But oh what an adventure it will be. Gypsinator where are you when your super powers are truly needed??? Foster parenting can easliy be compared to a really wild roller-coaster that you ride over and over again. Eventually you are able to tell that the ride is about to end and you know it won't be a gentle stop. Rather, you will be faced with a sudden, controlled crash and you know something will get broken.... mostly you heart. Today, the little sister of my heart and her husband are nearing the end of their ride. The two boys they took into their home and hearts over a year ago are moving to their forever home. In the past few days they have fielded hours of questions and dried millions of tears. The clothes and toys are packed, and all that is left are a few hills and loops before the ride ends this evening. Jen and Jae have had an amazing journey with these two boys. There is light where once lived only darkness. They have given themselves totally and unconditionally knowing that they would one day have to say good-bye. They are the hands of Christ working to save the lost and forgotten. Each day they plant tiny seeds in these little ones in their attempt to save the world one child at a time. Take heart dearest Jen, your transformation has been amazing too. You aren't the same person as you were a year ago. Take what you have learned, brace yourself and get ready for the next ride. Todd and I are here for you all the way! Time Moves On - Mommies are forever! It seems only yesterday I was holding my beautiful three month old daughter. She was so tiny and perfect. I was so in love. My heart filled with joy as she babbled and smiled while gazing into my eyes. I was "the mommy" and I knew I have been blessed with the greatest of miricles. So many people told me "enjoy every minute, they grow up so fast". Last night those words hit harder than ever as I watched my precious baby parade past with her 5th grade graduating class. She was so grown up, so beautiful. After the excitement died away and we got a few minutes alone she gazed into my eyes like so many times before. I am still so in love and she assured me I am and will always be her "mommy". I always wondered what I would be when I grew up.... I still wonder what I will be when I grow up. I've decided the easiest solution is to simply not grow up! I have learned to follow the path before me and pray for guidance at each cross roads. Every day is a new creation and I have the chance to ask "Lord what adventures do you have planned for me today?" Wow, He and I have had some doosies! And, now that He has reunited me with my long lost twin sister, (a year younger than me, born to a different mother on the oppoiste coast... who am I to question God?) things are only getting better! Uncontrolable laughter, scenic routes and demolation derbies are merely the tip of the iceberg.